In the third and final installment of what has turned into a little hatch chile series here, I bring you… Sweet potato, black bean & hatch chile enchiladas. I wish I could take credit for this inventive meal, but the creative genius behind this one is the Gluten Free Goddess. When I came across this recipe, I couldn’t wait to give it a try. For those who haven’t known me since I was five, I’ve never been much a fan of enchiladas. Really, it was all Mexican food that I had a general disdain for as a child. I know — shocking coming from the girl who blogs about salads and hummus varieties. But it’s not what you’re thinking. I wasn’t born with a radish in my mouth. Until high school, I snubbed my nose at fajitas and that funny-looking green goop (generally healthy options, I’d say) opting for of all things, a chicken fried steak. At a mexican restaurant. El Fenix for those familiar. My parents, God bless em – the only parents who had to coax their child into eating something doused in cheese – would attempt to get me to broaden my horizons, but I wasn’t having any of it. I HATED Mexican food. Later in life, mainly in college over margaritas and late night queso runs, I learned what I had been missing out on all those years. But still one thing I never developed a palette for was enchiladas. I have yet to come to terms with my aversion to sour cream and chili sauce. And I assumed all enchiladas were drenched in one or the other, or both. So this recipe totally blew my mind – enchiladas sans cream, sans chili. Instead these are loaded with vitamin and fiber rich sweet potatoes and black beans – one of the lowest fat proteins on the planet. 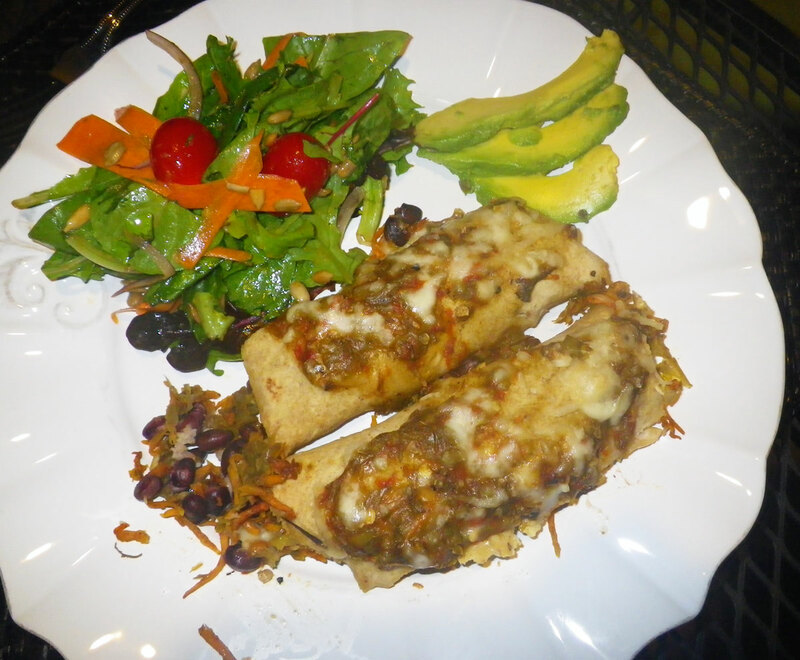 Dare I say it… an enchilada that’s both delicious AND healthy?! This really is the whole enchilada. This recipe is perfect, say, the next night after a meal with side of roasted sweet potatoes. Just double your sweet potatoes and you’ll have them to use in your enchiladas. Not planning ahead? What I’ve found to be the quickest and easiest way to get cooked sweet potatoes is to slice them julienne style using a mandolin, then just sautee them in a pan with a little olive oil, salt and pepper. The thinner you slice them, the faster they’ll cook (5-10 minutes) and you’ll be able to get on to the enchiladas. Another note… I used hatch chiles because at the time they were EVERYWHERE. Now you may be hard pressed to find one of these little containers. If not, just go with either fresh or canned green chiles. Depending on how much heat you want, use a mix of mild and hot. In general, green chiles are pretty mild, but if they’re labeled HOT, heed the warning. Preheat your oven to 350°F. Choose a baking dish that would hold 8 rolled enchiladas. Make your hatch chile sauce by combining the broth, dissolved arrowroot, green chiles, garlic and spices in a sauce pan and heating over medium-high heat. Bring to a high simmer. Simmer until thickened. Taste test and adjust seasonings. Set aside. In the meantime, for the enchilada filling, using a mixing bowl, combine the drained black beans with minced garlic and lime juice. Toss to coat the beans and set aside. In a separate bowl combine the cooked sweet potatoes with the chiles; add the spices. Season with sea salt and pepper. Pour about 1/4 cup of the hatch chile sauce into the bottom of the baking dish. Bake for 20 to 25 minutes, until the enchiladas are piping hot and the sauce is bubbling around the edges. Serve topped with a sprinkle of chopped cilantro. Pardon my mess…. I recommend using the thinnest corn tortillas you can find. The ones I used here were a little thicker so they were tough to roll. Hence the experimental stacking technique in the top corner. Which, by the way works too if you don’t feel like rolling. Just like traditional Mexican food — rolled, stuffed or sizzling… it’s all the same. Delicious. Nice going to add this one to the recipe book!